Some of favorite images from our postcards, labs, blogs, and Tweets are shown below. 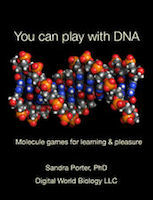 All of the images were obtained from either Molecule World or the Molecule World DNA Binding Lab Structure Collection. This image shows part of the capsid from Tobacco Mosaic Virus viewed in different modes with Molecule World. This part of the capsid is also called the lockwasher and the structure was determined by electron microscopy. Cytochrome C oxidase is a mitochondrial membrane protein that plays a crucial role in cellular respiration. One of the many subunits of this protein is also important because it's used in DNA barcoding. Can you identify the membrane spanning region? These two models show two different kinds of proteins that are used in nanopore DNA sequencing. On the left is alpha hemolysin and on the right is MspA from Mycobacterium smegmatis. Learn more about nanopores and DNA sequencing in our blog post, The Next Generation Science Standards meet nanopore sequencing. These two models show the QacR repressor from Staphylococcus aureus bound to the major groove of double-stranded DNA. On the left, this protein-DNA complex is colored by element and on the right, by molecule, thus demonstrating how coloring options can make features easier to see. This structure is included in the Molecule World DNA Binding Lab. This image shows DNA wrapped about histones in a nucleosome. These special structures are used to package DNA in a cell. Learn more about nucleosomes in our blog post, How do nucleosomes keep DNA from reaching the sun? This model shows antibodies from a human survivor bound to glycoproteins from Ebola virus. Learn more about antibodies to Ebola virus in our blog post, On antiserum and Ebola virus. This model shows the antigen-binding portion of an antibody bound to the hemagglutinin protein from influenza A. This is one of the many structures available in Molecule World. This model of spider silk protein Adf-3 is colored by charge. Learn more about spider silk and find out if Spiderman could stop a speeding train in Along came a spider. Orange G is a commonly used dye in molecular biology. Bromophenol blue commonly used in electrophoresis to mark the position of DNA in an agarose gel. Xylene cyanol is commonly used in electrophoresis to help estimate the position of DNA fragments agarose gels.